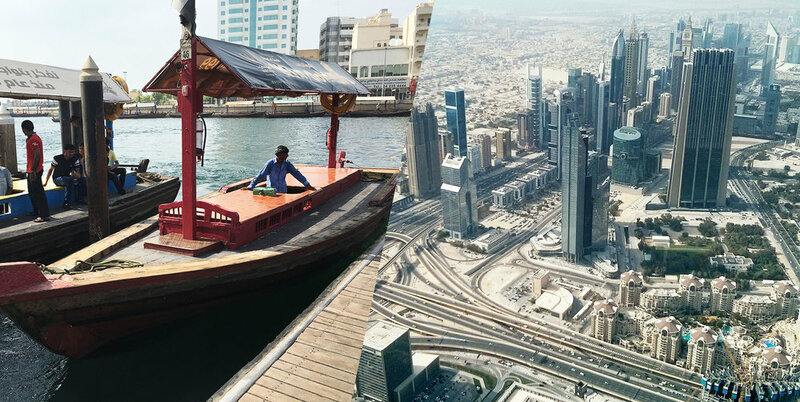 Despite its infamy as the 'City of Gold' there's another side to Dubai. Roaming reporter Alwiya Bafagih takes you on a natives guide to the city. Before the name Business Bay reigned over the trade sector in Dubai, Deira was the place to be for most aspiring foreign investors. The name Deira comes from the Arabic word deyar, meaning home, and this is quite fitting as it is the region where the initial growth of Dubai started, owing to its port on the Dubai creek side. Due to the fruitful trade that connected the city with other countries of the world, the region flourished with souqs (markets) and became a hub for locals and visitors alike. Some of these markets include the Old Souq, Gold Souq as well as Souq Naif that offer a wide array of products such as perfumes, spices and dried foods. Some notable spots to see are the Clock Tower Roundabout, a landmark of Deira, as well as the small boat rides called the Abra, which were used as a means of transportation used to ferry people from one side of the creek to the other. Right on the opposite end of the creek to Deira is Bur Dubai, once known for being a more contemporary shopping district. Being further away from the sea, the word Bur Dubai in its literal sense translates to inland Dubai. Aside from having one of the oldest shopping malls in the Emirates, Bur Juman, as well as the once busy Shindagha vegetable and fish market, it is also rich in Emirati culture, which has been modestly showcased in The Heritage Village. Stalls lining the perimeter of small sandy enclosures, resembling that of traditional Emirati houses, display and sell crafts made of straw, ethnic silver jewelry as well as food, including a well-known sweet, luqemat; fried dumplings covered in date syrup. However, in the face of entertainment inclusive, air-conditioned shopping malls and theme parks, such abodes are struggling to compete. In turn, there have been recent projects like Al Seef (the riverside) that have been built to restore the folklore in a charming meshwork of old and new. Transitioning to the more residential areas of the city, Al Satwah (The Power) and Karamah (Dignity) are neighbourhoods worth visiting. Located not far from the lavish coastal communities, these zones are contrasting to the famous image of exclusively-for-the-rich Dubai. These regions were once sprawling in clusters of old apartment buildings, known as colonies, which were initiated during the formative years of the UAE by the very first Sheikhs and housed expatriates for years to come. Albeit most of them have been demolished and replaced with modern houses, some of them still remain and offer a glimpse of a much meeker time amidst the glittering towers and monuments. Restaurants of ethnically diverse cuisines, textile and inexpensive toy shops, as well as graffiti-plastered walls, surround these colonies, while afternoon rounds of cricket matches take place between buildings and parking lots. It is from this angle of lower rise buildings that the Dubai Frame, an architectural construct that captures the two sides of Dubai, can be seen. For prospective newcomers, these centralized regions are prime locations since they provide easy access to the rest of the metropolis. Stemming from the word Qumeirah, which in the native tongue is synonymous with the moon, Jumeirah, a high-class locality hemmed by the seas of the Arabian Gulf, has always been equated to money. Even during its infancy, it was where the rich went to bask in the Middle Eastern promise of sun and sand. In spite of having an extravagant reputation, Jumeirah is still home to some of the oldest mosques and local fishermen communities. Against a milieu of rocketing structures small family parks and baqalahs (grocery stores) bravely thrive. Keeping up with the theme of luxurious living, Mamzar is also one of the more posh sections of Dubai. Nevertheless, because of the higher percentage of the fairly conservative local population, it presents a humbler environment. In the turns and corners of this peaceful society, museums and libraries supporting the native culture as well as inexpensive cafeterias, known for their eccentric array of menu item names and the mind-jolting cup of karak (strong tea), can be seen. Taking a final drive through the meandering roads of Mamzar, bordered by the family-friendly Mamzar Beach Park, one leaves the borders of Dubai into the adjacent Emirate of Sharjah. While undoubtedly being a city of pearly dreams for excited tourists, the opposite side of the frame is also an experience worth appreciating. Johnson, Alice. “Soul of Satwa.” GulfNews, Gulfnews, 3 Oct.